Live Clean coupon can be found in the store in the Live Clean baby section. There are 4 coupons in the Live Clean baby coupon booklet, including descriptions of all the Live Clean baby products available. 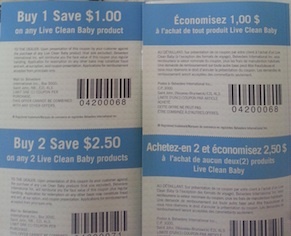 The coupons inside include Buy 1 Save $1 on any Live Clean baby product in english and french, and Buy 2 Save $2.50 on any 2 Live Clean Baby products in english and french. Developed with your baby and the environment in mind, Live Clean Baby delivers results with natural, gentle ingredients, caring for babies’ delicate skin using plant-based formulations enriched with certified organic botanicals. Live Clean Baby Soothing Baby Wash is specially formulated with natural colloidal oatmeal and chamomile to gently cleanse, and help soothe baby’s dry skin. Lightly scented and hypoallergenic, this mild, tear-free formula is pediatrician tested and gentle enough even for babies with sensitive skin.